The Katha Upanishad is an important conversation between Naciketas, a young man and Yama, the Lord of Death. 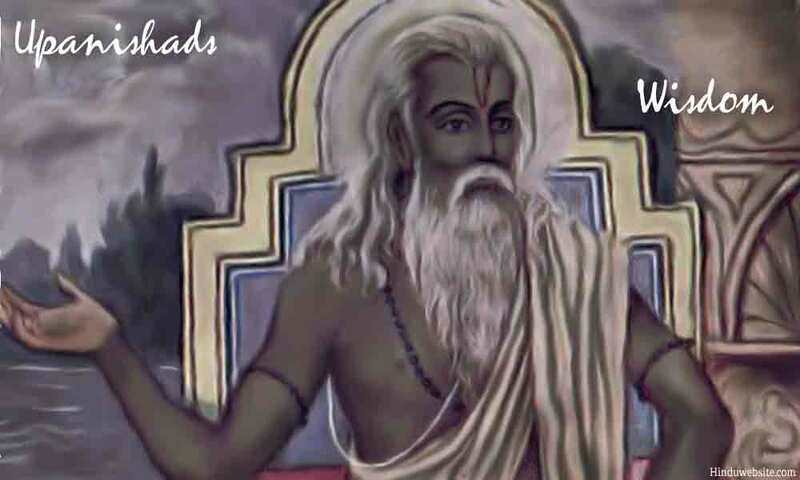 According to the Upanishad, Naciketas was sacrificed by his father Vajasravas in a fit of anger and upon dying, he went to the world of Yama and waited there for three days. When Lord Yama came to know about this, he felt greatly concerned as he made a pious Brahmana boy, pure and innocent, wait in his house for three days without receiving the honors due to a house guest. Lord Yama did not consider Naciketas a sinner, but a pious soul worthy of honor and respect. To rectify his lapse and avoid the sin of neglecting a house guest, he offered Naciketas three boons. Naciketas accepted them with great dignity and humility and determined to make the best use of them. What followed was a long conversation of great philosophical importance between the two on the relevance of materialism, spiritualism, self-knowledge, Brahman and liberation in human life. The Katha Upanishad has a few verses in common with the Bhagavadgita and the conversation between Lord Yama and young Naciketas is spiritually as profound as that between Lord Krishna and Arjuna. While Naciketas had a long conversation with Death itself in the house of Death, Arjuna saw the most terrifying universal form of Death (Kala) in the battlefield of life. The similarities are thus very striking and profound. The Upanishad also signifies the importance of Aum and the practice of yoga. Most importantly, some important lessons are hidden in the legend of the Naciketas which are relevant to modern life and they are listed below. You get limited opportunities in life. Make use of them. Life is short. Most of the time it is your actions which determine your destiny; but sometimes you get chances or opportunities to improve things or redirect your life in the direction of your desires and dreams. Naciketas got one, though under unfortunate circumstances. Because of a mistake committed by Lord Yama, he was offered three boons, and he made good use of them not only to acquire knowledge and become liberated, but also help his father, who wronged him, to live in peace with a tranquil mind. You have to remain steadfast in your aims. Naciketas was determined to seek knowledge for his liberation. He wanted to know about the secret knowledge of the individual Self and the Supreme Self and how one might escape from the bonds of the phenomenal world. Despite Lord Yama's persistent efforts to distract him with the temptations of material wealth and worldly pleasures, he remained committed to his spiritual goals and affirmed them repeatedly to Lord Yama. In life, we often get distracted by problems as well as fresh opportunities that are seemingly good but may actually interfere with our goals and hamper our progress. We must therefore remain steadfast in our aims, once we choose them and make up our minds, even in the midst of problems and distractions. If you are persistent you will have your way. Dreams and desires are part of life. Even aimless people aspire for things. All may not have clear and precise goals, but everyone entertains vague ideas about their future, where they want to go, what they want to do to make themselves happy or prosperous or how they want to help their children and family to succeed in their lives. In the end, only a few manage to reach their goals. What makes the difference and contributes to their success is their persistence or perseverance. Naciketas kept his conversation limited to the knowledge he wanted to gain. Keeping the mind focused in a world like hell, where not a moment passes by without someone being punished in the most gruesome manner, is not easy. But even in death, Naciketas remained firm in his resolution and kept looking for the information he thought was necessary for his liberation and the welfare of other spiritual aspirants like him. It was not easy to please Lord Yama. But with his steadfastness, he managed to accomplish that. Death is a teacher we all can learn from. We usually avoid thinking of death. We are afraid of death. We look at life and turn away from any haunting memories associated with it. From the Katha Upanishad, we learn that even death has lessons to teach and for a pure and resolute soul, it willingly imparts liberating knowledge. In the Bhagavadgita also, Lord Krishna, appears to Arjuna as Death (kala) only in his fiercest form. There also, He taught him valuable lessons about duty, knowledge, intelligence, liberation, the real Self and how we may relate to God in a mortal world. In the Katha Upanishad also Lord Yama taught many valuable lessons to Naciketas. Buddha's life and outlook changed forever when he saw sickness, decay and death in the streets of his father's capital city. Until then, he never thought of mortality and the causes of human suffering. We all can learn good lessons from death, by having a conversation with it, by observing it, by understanding it, by thinking about its significance, the transience of life, and the need for developing detachment, philosophical outlook and an attitude of renunciation. Your character speaks for itself in adversity. Under unfortunate circumstances, Naciketas incurred the displeasure of his father and became a sacrificial offering, which resulted in his death. Death did not deter him. Death did not terrify him. He waited patiently for Lord Yama to come to him and speak to him. He did not lose his balance, when he was neglected for three days without proper care. He did not succumb to distractions and temptations when Lord Yama offer them to him. He impressed Lord Yama so much that, he earned his respect as well as his favors. Naciketas, might be a young man in his current life, when he was sent to hell by his insensitive and materialistic father as a gift to Yama. But he had character. He had serenity and stoicism, He had been building that great character of his and preparing himself for that important occasion for several lives. Otherwise, the very sight of Yama would have sent him into a terrible consternation. Without inner purity and moral character, he would not have been able to stand his ground and impress him with his knowledge and determination. In difficulties, people tend to lose their faith and resort to shortcuts and questionable practices. In worldly life, sometimes they may succeed with such tactics, but in the end, they will leave deep scars in their consciousness and influence the course of their future lives very adversely. Character, good behavior, commitment to truth, mental and physical purity are essential, even in this life and these times, if you want to turn to spirituality and live your life responsibly and spiritually. We are here to perform certain duties even in death. Death is a phase in the life of a being, a door to another existence. It is a pause in the long journey of the soul upon earth. In death is hidden the process of renewal, a new becoming, a new opportunity for the soul to begin anew, atone for the past, and make peace with it. Death does not end our duties. Until we achieve liberation, our duties and obligations continue even after death in the other worlds. The wheels of karma keep moving, life after life, and in between. Our actions keep producing consequences, even after we depart from here. This is an important revelation, especially for those who think that with suicide they can end their problems. Many people out of anger, frustration, fear or depression, commit suicide. This is the worst option to which one can resort, since it will lead to very negative consequences. If anyone wants to commit suicide, here is an advice. Think you are already dead and live as you if do not exist and as if nothing matters. In death, Naciketas achieved for the mortal beings supreme knowledge by which one could attain liberation. His selfless effort not only helped him, but also led to the emergence of Naciketas fire sacrifice, which was previously unknown to the world. Even while having a conversation with Lord Yama, Naciketas did not ignore his obligations towards his father. He asked Lord Yama to make sure that his father lived peacefully, without suffering from guilt and anger. In other words, Nachiketas did not forget his obligatory duties even in death. Katha Upanishad is about overcoming death by understanding it and learning from it. Immortality cannot be reached without understanding mortality. Death is here to teach us lessons, to let us know that we cannot take our lives for granted, we cannot become overly attached to things, that our purpose here is to understand our existence and see how we may use the opportunities to broaden our knowledge and establish a basis for our permanence and freedom from death itself. From the Katha Upanishad, we learn that you cannot bargain with death. You can only make peace with it, with character, spiritual aims, restraint, dutifulness, knowledge and purity.